When Samsung launched its refreshed lineup for its S series flagship smartphone, the fans were pretty happy. Now it is seen with company’s Note series as well, even though the direction company took with Note 5 was unusual, but was also required in a sense. The new and improved hardware design is something that we had looked forward to & came the full metal build which the Note users have been craving for a long time. But does the new flagship from South Korean beats the current competitors in the market? Is it that good to upgrade from your Note 4? We answer all your queries in this detailed review of the same. The Galaxy Note 4 set a benchmark for Samsung as that’s when the company started to incorporate metal design on its smartphones. And within just six months we saw the Galaxy S6 sporting a full metal-glass design that was liked by many, which has been an Inspiration for the Note 5. And that’s not a bad thing; the Galaxy S6 was a huge success despite some might say it didn’t have a practical design, as well as the questionable ergonomics. The Note 5 is wrapped around in metal with great precision. Despite the glass body, the device doesn’t feel as slippery as it should, which is a good thing. From strength and usability point of view, it is quite impressive. The screen on Note 5 is quite large even though; it doesn’t feel like a big phone; maybe because it had thin bezels on the front and trimmed downsides on the back glass. The glass that is used on the front as well as on back gives protection of Gorilla Glass 4. Though, there is still some typicality that is present on Note 5 such as the physical button with fingerprint sensor, the capacitive backlight buttons, and the usual placements of power button on right edge and volume button on left edge. Talking about the edges, the bottom edge is packed with a lot of things. There is a 3.5mm audio jack, microUSB port, microphone and of course, the S Pen. While on the top edge SIM tray facility is provided. Note that the IR blaster is not present on the device. The phone no more allows you to expand storage via microSD card as well as doesn’t offer a removable battery, since it is a unibody design. But the combinations of new design changes make it feel small for a 5.7-inch phone. Despite having the same screen size, the Note 5 is shorter, narrower and thinner than Note 4. Overall, the biggest win for the new design is that it doesn’t actually feel much bigger than any other smartphone out there in the market. The South Korean giant is arguably the chief among smartphone display, which is evidenced by the fantastic panels that company puts on their phones as well as on tablets. If you’re not aware, then let us tell you that company also sells its display to other manufacturers. 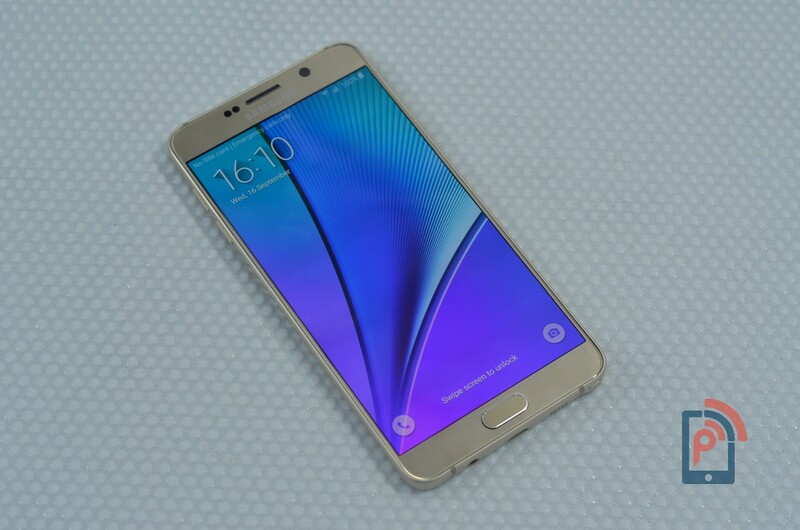 The Note 5 is launched with similar 5.7-inch QHD display that was present on the Note 4. But there are some improvements that are clearly visible when we put these two devices side by side. I mean the display on Note 5 won’t make your eyes pop out in amazement, but it clearly has some upgrades that make colors crispier than ever. There is not even a single thing that I can point is wrong about this display. With better viewing angles and brightness levels under the sun, the legibility is out of the question. You can easily see and experience what’s happening on the 2K resolution display. All thanks to Super AMOLED technology and Samsung’s continuous hard work to improve the display quality. The device certainly has one major issue which is the smudges it gets because of the glass protection, making it a fingerprint magnet. Overall, it’s the best display you’ll ever get on a smartphone. Samsung hasn’t changed its TouchWiz UI drastically in terms of the design of the Note 5. It is quite similar to the latest update on the Note 4. And the differences are more subtle if you compare it with Galaxy S6. Other than the small change to the launcher, the only thing different that you’ll notice is that it has new iconography. That is, the stock icons are shaped in rounded-off squares; moreover they’re more colorful and flat in looks. On the Software side, we did find some trimming on the unnecessary features of the UI, that all started with the S6. Though, I feel that all the Samsung apps should also be available on the Play Store like the recently announced S-Health App availability for Non-Samsung devices. Baking them in the system rather than putting as optional is quite painful because these pre-installed apps are not resourceful to everyone. I like that at some places in the interface, company has intuitively inserted an action to download their apps. Such as whenever I record a video and go to menu option in gallery, I see an action button that’ll take me to the page where I can download the default Video Editor of Samsung from Galaxy Apps Store. Now as for the Bloatware concerns beyond Samsung’s apps, it will depend on whether you’re getting an unlocked device or a contract one. If you’re in the U.S., Verizon or AT&T would be bundling their usual suite of apps, most of which can be disabled. The unlocked version would still hold apps like Facebook, Instagram, WhatsApp and the Microsoft’s set of apps like OneDrive, Skype, Excel, and Word. The Galaxy Note series were always about doing something more with a large screen, although, apart from a couple of features Samsung never really did make use of the extra real estate. It is the bigger change that Note 5 actually packs higher display density than Note 4. In an ease of totality, it means you can fit more of everything on the screen. The Gmail would show you more messages in the list of your Inbox, Google Maps would show more maps and less interface while browser would show more content and less navigation. You understand these things once you start to use the device. Making the larger screen work for you is one thing but shaping the software is as well important so that it can be operated easily with one-hand. On Note 5, Samsung offers such two options where one shrinks the screen down to adjustable size with three quick taps to the home button. While the other option permanently slides the keyboard, dial pad, as well as few other input elements to the left/right side of the screen. Both of these options are quite resourceful when it comes to one-handed usage. But they somewhat make it look silly and confusing. 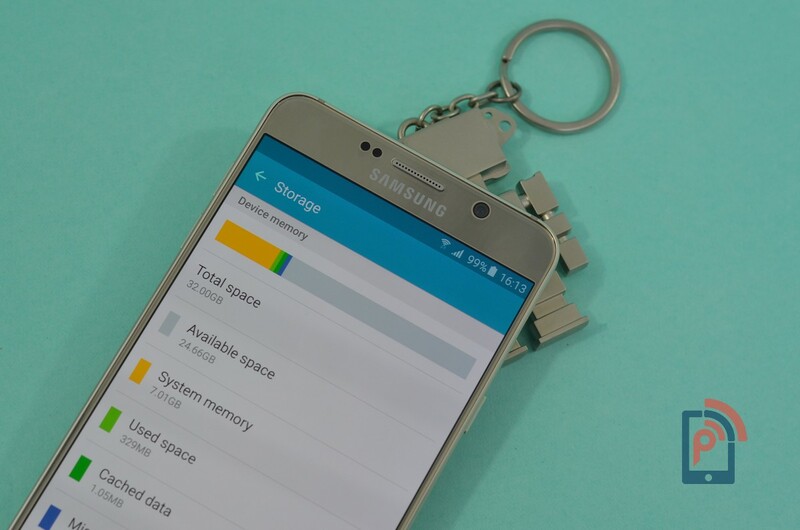 Talking about the internal storage on the Note 5, we have the 32GB golden edition that comes with more than 24GB of free storage space. That is quite the storage for me, and if that’s not enough, I can always keep my files on an USB OTG drive, which is supported by the device. Since, there is no microSD card slot for expansion; you’ll have to choose between 32GB or either 64GB variants. 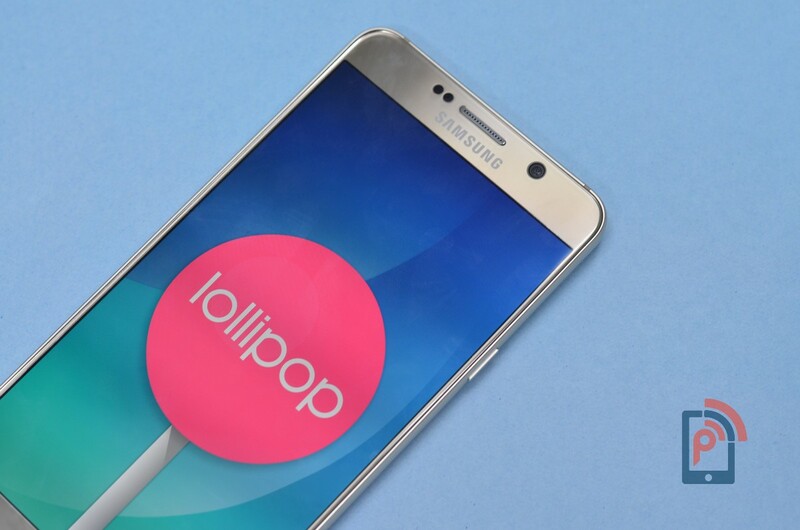 The Note 5 packs Samsung’s homegrown Exynos 7420 chipset, an Octa-core processor with four 2.1GHz Cortex-A57 cores. Yes, it is the same processor that powers up the Galaxy S6. So, now you’re getting the Idea why we are calling it the bumped up version of S6. With Snapdragon 810 issues going on in the market, it was wise of Samsung to go with a processor, which is quite snappy in performance as well as doesn’t heat up a lot. The reason it’s better than SD 810 is that 7420 uses smaller and efficient transistors. That’s why it can rav up to 2.1GHz without getting too hot to handle. At first it was quite surprising, because with metal glass unibody design you expect a lot of heat coming your way. During my Skype call sessions, I barely notice any heat signatures on the back while holding the device in my hand. Yes, I do a lot of Skype calling! 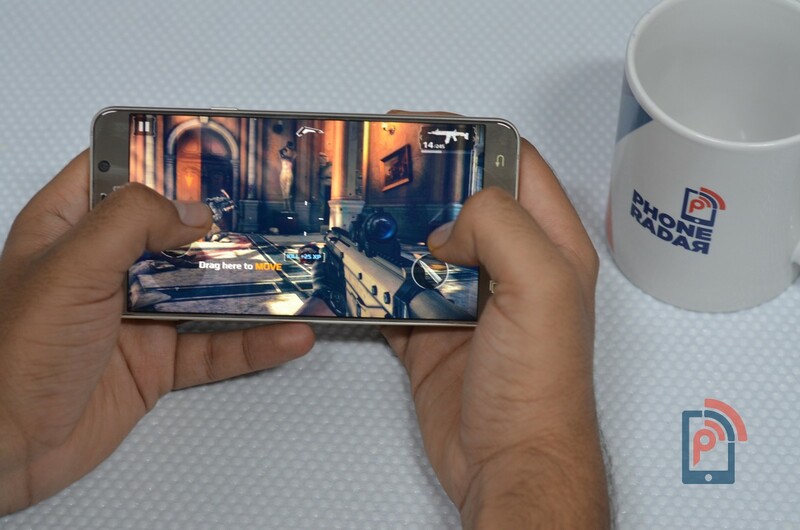 Moving on to gameplay, the device can play games like GTA V, Asphalt 8, and Modern Kombat 5 without even sweating a little. We even tried to make it sweat, but even switching between these games was quite easy for the device, all thanks to the 4GB of RAM. Even after opening a considerable number of apps, there would be some free RAM left, and it would allow the device not to lag while switching between apps. Talking about the benchmarks, the device scores staggering 61972 in Antutu Benchmark while in Vellamo it scored 5130 for the browser, 2523 for metal, 2952 for Multicore. For browsing the Note 5 is as best as you get. The pinch to Zoom-in and Zoom-out is buttery smooth. Moreover with large display size, browsing desktop sites is quite convenient and easy to operate. Overall, the device is beast when we talk about the performance. The powerhouse it holds under the hood is just mind blowing; I never saw it struggle to do any task I performed. Oh, I almost missed the Fingerprint sensor talk! And that maybe because it still got the same sensor that was present on the previous Note, but, of course, there are some optimizations that make it more efficient than before. We didn’t expect any major upgrade in this regard but certainly was happy with what is being offered here. If you’re in the market hunting for a great phone with stylus feature, you pretty much got only one option, i.e. a Galaxy Note. Samsung has cornered this market over the years with its Note series, but the company still tries to improve the feature by introducing new features. For those who are not familiar with what S Pen allow you to do,then let me briefly explain it to you. The S Pen is a writing tool on your device that offers abilities like taking screenshots, creating action memos, cutting images, writing on the screen and sharing it. There are lots of things that can be done using the S Pen. Talking about the new features on S Pen, Samsung has improved it’s already resourceful stylus to another level. Firstly I’ll address that the automatically eject system is quite convenient. Earlier the S Pen has to be pushed out, which wasn’t hard, although it has been made better now. Further is the scroll capture that comes in handy when you want to take screen grab of the number of pages together. And my favorite is that action memo is available as soon as you take out the S Pen even when the screen of the device is off. Talking about the Air Command, it opens up when you hover the stylus to the menu floating on the screen. Now the feature offers to add third party apps in the dock. It means you’ll able to pin the third-party apps that take advantage of the S Pen Stylus. This year Samsung has been consistent with its smartphones in many things, aside from the metal body, the Camera was one of the things. It is pretty much exactly the same that we saw in the Galaxy S6 and S6 Edge. Hey, I’m not complaining, because it was the best camera. You get a 16-megapixel sensor with a fast f/1.9 lens and optical image stabilization. Don’t just believe on the specs it was really fun time spent with the camera on Note 5. The best thing was that it was quick in catching the moments, very responsive in all conditions, may it be a night or day. The Autofocus feels faster than the previous Note camera; the hit rate is quite good, you will get great captures 99 times out of 100. The image quality is magnificent too. The Auto HDR mode was the thing I could use every time I capture a moment. The auto exposure, color saturation, great detail and excellent dynamic range were the highlight. In many phones, I have experience that HDR mode is like a special effect that can only be used on occasional times. While on Note 5 it helps bridge the gaps in quality between normal and HDR captures. Low-light captures are quite interesting. All thanks to the optical stabilization that avoid making your low light captures blurry. With OIS and a large lens to capture as much as light possible, the details and color fidelity don’t get faded away in night captures. Talking about the camera app, it is quite easy to use, if you’re familiar with Samsung devices, then you’ll quickly get used to it. It’s simple on the surface, although has loads of extra features underneath once you scratch the surface. The new amongst the modes is the Pro, which lets you control every aspect of a camera stat. That includes exposure time, saturation level, ISO and many more aspects. Though, if you get the hold of phone tripod, then you can further increase the low light capabilities of Note 5. All you need to do then is keep ISO at low, increase the exposure time and you’ll be able to get some great details in low light conditions. The front camera on the Note 5 has been bumped up to 5-megapixel from 3.7-megapixel on the Note 4. And it reflects in the images that we took during daylight, but not quite in the low light. It isn’t a selfie-focused smartphone, so I don’t want to get judgy to the capabilities of the front cam. Though, I would say that it is quite the charmer for a group selfie because of the wide angle lens. Overall, these are the best cameras you’ll get in the market right now. It’s was a surprise that company kept battery capacity at 3000mAh on the Note 5 while it was 3220mAh on the Note 4, a clear low of 220mAh. Maybe it’s not that a big number, but we thought battery life was the only thing that we didn’t enjoy as much as on the previous Note. I didn’t get more than 4 hours of Screen-on-Time (SoT) with Note 5’s battery life, which was quite not on par with Note series standard. And that made be disappointed. Though, it isn’t that bad when compared to other high-end devices such as LG G4. Overall, the battery life lasted more than 12 hours, and its good enough for a phone with fast charging. Now, that we’ve come to talk about charging let’s shed some light on how much time Note 5 takes to charge from zero to hundred. While I was not impressed with the SoT of this device, but the charging capabilities made me change my overall opinion about the battery. If you use the fast charging adapter that comes in retail packaging unit, then you’ll get around 90 minutes of charging time from zero to hundred. And out of that first 50% within 30 minutes, although, the company claims you’ll get 60% in 30 minutes. It still is better than any other devices in the market. So, just remember you don’t need to charge it all night. Note that the battery percentage drop during an idle time of around 6-7 hours was 4-5%, which is not quite good, but also not bad either. This year Samsung may have bumped up its Galaxy S6 to make its Note 5. And we are fine with that, actually more than fine. In spite of the similarities with S series handset, you do get some advancements on the new Note phone when compared with the Note 4. Samsung has tried to improve every aspect of the experience Note series provides. May it be slimming down the device, improving the materials, increasing the hardware, giving software the buttery work, refining S Pen capabilities and optimizing the battery/fast charging. So, is this the ultimate premium smartphone, you have been waiting this year to upgrade? Yes, it is that smartphone. Previously, the Note phones only appeal to a selected audience that wanted a large device for business and media consumption. With this year’s advancements, we see the Note series heading to more hands. But of course, to get this device you would have to take out a ton of cash, at least Rs 53,900 for 32GB model. The price comes with the territory when you talk high-end Samsung phones.